Book your escape at Twelve at Hengshan, a Luxury Collection Hotel, Shanghai. Our exclusive Shanghai hotel offers luxury accommodations & unmatched experiences. Get directions to Twelve at Hengshan, a Luxury Collection Hotel, Shanghai. Our Shanghai map & transportation guide will help you get to know the area. 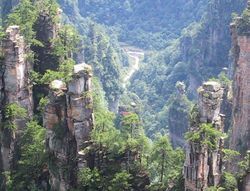 Hunan Tours: Packages to Zhangjiajie, Changsha, Fenghuang,Hengshan, Jishou, Huaihua and Hongjiang as well as Hunan Tours from Beijing, Xian and Shanghai with 7/24 Travel Service offered by China Travel Agency!